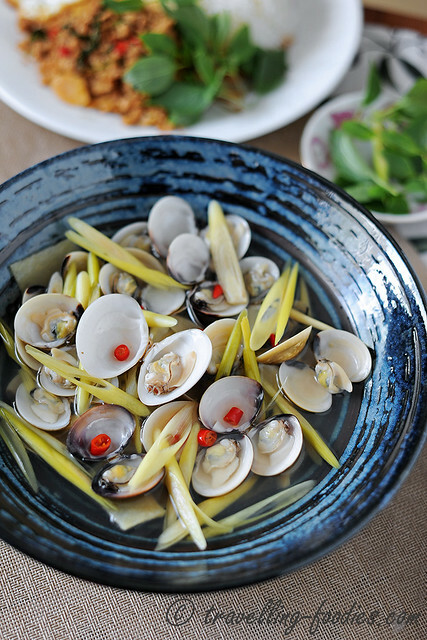 According to Syebvonne, “hup” means to steam which is why some would translate this dish to “Steamed Clams with Lemongrass”. But it can also be taken to mean “boil” which is what is actually been done! “Con” meaning something really small like a baby and in this case, it refers to the “ngheu” which are clams in Vietnamese! So here’s a quick Vietnamese Food Talk 101 for you! The ingredient list is really short in this preparation. The flavours are mostly clams and lemongrass. Chili padi is added for a hint of spiciness and of course fish sauce, which is found in practically every Vietnamese savory dish is used as a seasoning. Otherwise the flavours are kept really really simple. 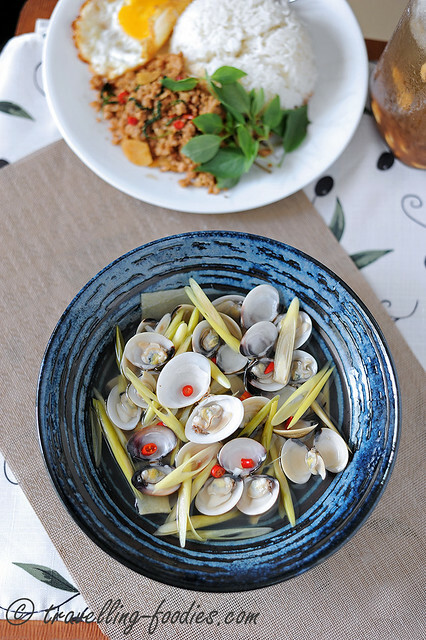 Yet so piquant, the taste of the sea from the fresh clams used, which is really lovely and the beautiful bouquet of aromas from the lemongrass, ginger, and not forgetting the fish sauce! As with all seafood dishes, use the freshest clams one can lay hands on! 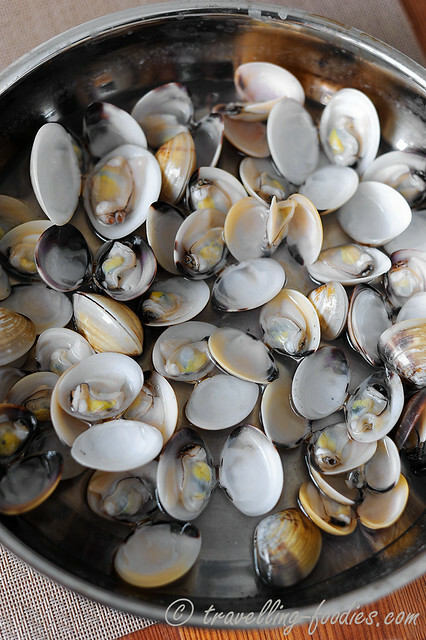 The clams are soaked for half a day in water with some salt added, accompanied by water changes a couple of times in between if possible. This allows the clams to open slightly for any sand trapped within to be flushed out. The clams are then scalded n a shallow saucepan with boiling water. Those that open up widely are good to go! Discard those who which remain closed. Don’t pour the steeping water down the sink as it holds so much flavour from the clams and thus forms the base for the broth! 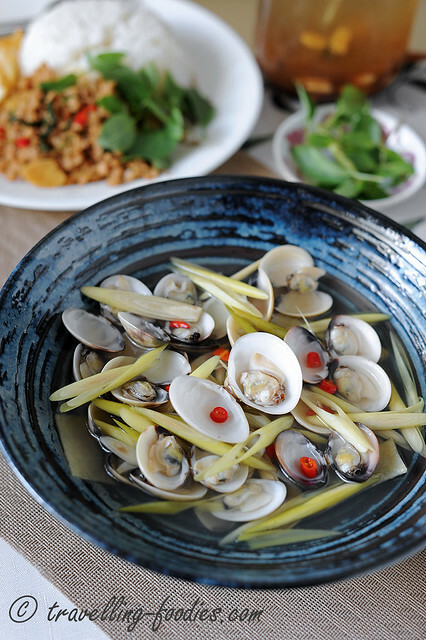 Simply remove the clams to prevent them from overcooking and add lemongrass with the other ingredients to complete the broth. Return the clams during the last moments of cooking and the dish is ready to be served, in just a matter of minutes! Give fresh clams a good rinse. Scrub the shells if necessary. Soak them in water with a pinch of salt for at least 4 hours. If possible, rinse and change water 1-2 times in between. Bring a saucepan or wok with some water to boil. Turn off heat and add clams into water and cover the lid. In a matter of seconds, the clams will begin to pop open. Remove the clams which have opened with a pair of tongs or slotted spoon onto a separate plate. Discard any clams which remain closed. 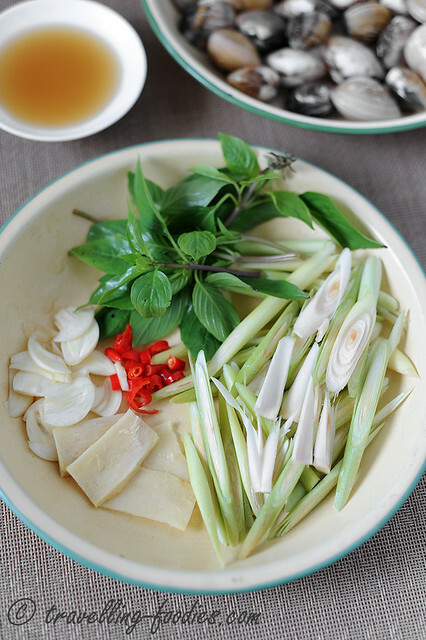 To the clams steeping water, add sliced lemongrass, ginger, garlic and chili padi. Top up with more water if necessary. Bring the broth base to a boil and cover with lid. Leave to simmer for 10-15 min. Season with fish sauce and sugar if necessary. Return cooked clams to the broth and stir well for approximately 30s or so. Do not overcook the clams. Ladle into a bowl, sprinkle a dash of pepper and garnish with basil leaves if using. Serve immediately with other dishes. This entry was posted on June 26, 2014 by Alan (travellingfoodies). It was filed under Food, Simple Eats and was tagged with cili padi, clams, Con Nghieu Hap, fish sauce, ginger, lemongrass, Vietnamese Clams in Lemongrass Broth. Nice post on Vietnamese food! My family has a summer home with a clamming beach right nearby, so we always used to dig clams for clam chowder. You mentioned fish sauce and lemon grass, which I enjoy a lot and normally associate with Thai food, probably just because I haven’t been exposed to Vietnamese food nearly as much. Therefore, I was wondering as I read your post, are Thai and Vietnamese foods about as similar as Greek and Italian? What are a couple main differences between to the two? (As far as I have seen, all the Vietnamese restaurants in the states are pho joints, so I just don’t know much else about Vietnamese…) thanks for sharing your experience! I can already imagine the sweet broth. I was in Ho Chi Minh city and still eat it every month a few times. Delicious oysters, in addition broth citronella and chili drink very interesting.